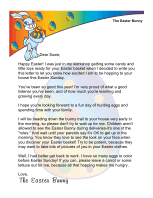 This is a funny letter from the Easter Bunny to a grownup or a much older child, as it jokes around about bunny poop, rotten eggs, and biting the ears off chocolate rabbits. Oh, hello there. I was just off making some jellybeans. And I'm not talkin' about the candy kind, if you know what I mean. I hope you're enjoying Easter Sunday. I've really been focusing more on the kids the last few years (the economy, you know). But please note that I've left you a few little treats that I know you'll like. 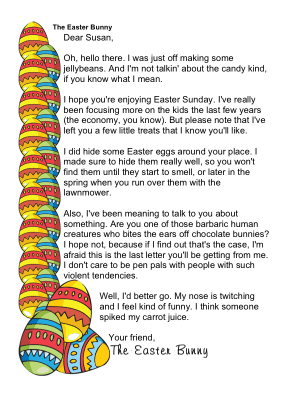 I did hide some Easter eggs around your place. I made sure to hide them really well, so you won't find them until they start to smell, or later in the spring when you run over them with the lawnmower. Also, I've been meaning to talk to you about something. 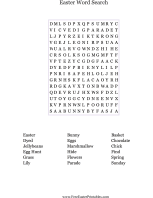 Are you one of those barbaric human creatures who bites the ears off chocolate bunnies? I hope not, because if I find out that's the case, I'm afraid this is the last letter you'll be getting from me. I don't care to be pen pals with people with such violent tendencies. Well, I'd better go. My nose is twitching and I feel kind of funny. I think someone spiked my carrot juice.